Ceremony canopies are a great way to mark the space where you will say "I do," and it's especially helpful for an outdoor wedding. You can set up the backdrop poles and poly satin drapes in a way that will cover the two of you and your officiant. It will not only giving you a definitive space, but the canopy will create a beautiful frame for pictures while you're reciting your vows. On your wedding day, you will probably be photographed more times than any other day of your life. Not only will people be taking pictures of you, but they will be taking pictures of your guests as well. It is so nice to have a place where you and your guests can be photographed with a beautiful backdrop. This is especially helpful if your reception is inside. Set up some white drapes for a wedding reception, add some flowers or other props, and let the flashes commence. If your reception venue is wide open, you might want to find a way to create separate spaces for your guests. You can create a kind of lounge area for your guests when they want a break from dancing. Simply surround a space with satin drapes. You can use pipes and drapes to create tent space for the illusion of separation. Place some comfy seating under the drapes and you have yourself a lounge area. You've set all the tables for your guests to sit at, but don't forget about the gift and dessert tables. You might also have a table for favors, the guest book, and other decorations. Even the buffet tables need some attention on your wedding day. 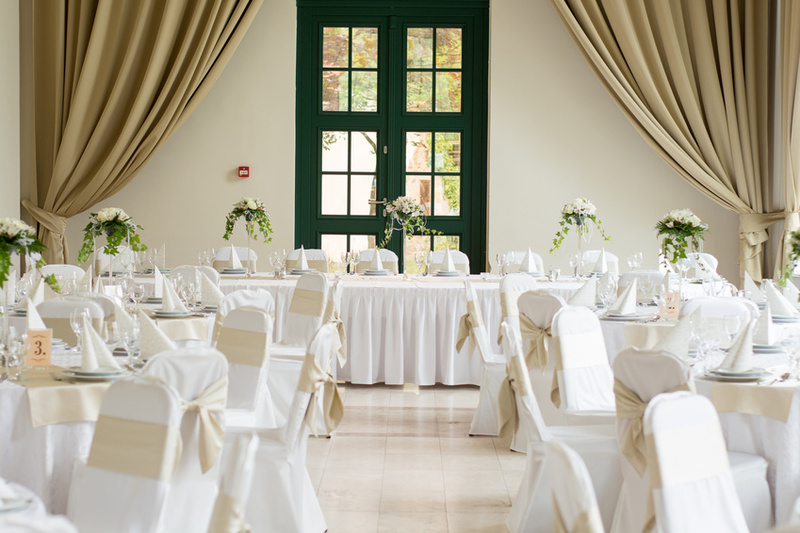 You can set up some table linens and drape skirting so the tables look as elegant as you do. Who doesn't dream of having a dramatic entrance at their wedding? A pipe and drape system can help you do just that. You can set up satin drapes for walls, add some sparkling fairy lights, and even roll out a carpet lined with flowers for you and your brand new spouse to walk into the reception. There are roughly 134,000 people employed by the party and event planning industry in the United States. Whether you use an event planner or plan your wedding on your own, don't forget to include pipe and drape backdrops to make your wedding even more stunning.